"There are nearly half a million kilometres of rural road verge in the UK. Brackenley Lane is a rural road near Skipton, North Yorkshire; over the past year or so I have walked this 2 km section of road extensively in order to access the moorlands to the west and north. This habitat faces many threats, such as volume and type of traffic, Invasive Non-Native Species, inappropriate management, litter and the conversion of contiguous land (Skipton Golf Course being an example). 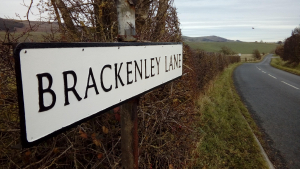 Therefore, the aim of this project is to record the flora and fauna found along the verges of Brackenley Lane, with the objective of raising awareness of road verges as a valuable and viable habitat. On iSpot I will only be submitting records supported by photographic evidence; given the limitations of using the camera on my phone to achieve this it is likely that motile species may appear under-recorded. However, I am running the same project on iRecord which includes all observed species evidenced by photographs and/or field notes.